Celebrating the Fun Jewish Holiday of SHAVUOS—Receiving the Torah! Ice Cream & Cheesecake Kiddush Party! Dairy and Non-Dairy (Pareve) Ice Cream Served. Yom Tov Stories, Songs & Jugglers! All Ages (and Parents) Welcome! Special Teen Party, too! Everyone—men and women, teens, boys and girls, toddlers, even infants — can do a mitzvah! 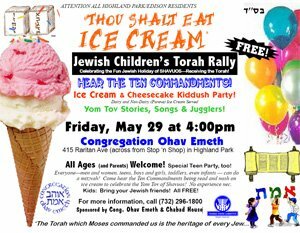 Come hear the Ten Commandments being read and nosh on ice cream to celebrate the Yom Tov of Shavuos! No experience nec. Kids: Bring your Jewish friends! All FREE!